As we fast approach Summer (although the weather may not have quite yet realised! ), we are increasingly finding more clients making enquiries about large outdoor screen events. Following the adaption of the American ‘drive-in’ cinema, ‘outdoor cinema’ is becoming increasingly popular, and makes for a very exciting and impactful event. However, with our Great British Summer, do the benefits outweigh the risks? 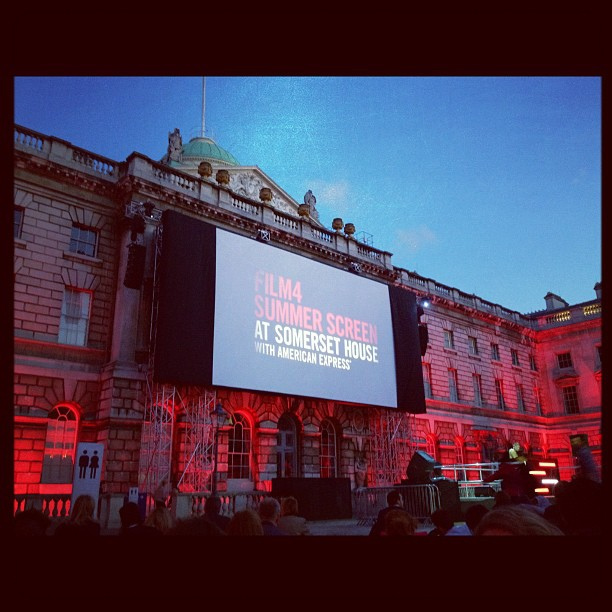 From the Film 4 Summer Screenings at Somerset House to the more recent Silent Cinema at London Zoo, showing video, animations, or film in an outdoor setting is a very memorable experience, where the audience can really relax and take in the setting, creating a unique event. However, they can be technically hard to master, with many more variables to take into account than your average indoor event, and some specifics which do require a specialist audio-visual provider who is proficient at anticipating risks and planning for these events. Firstly, however picturesque the venue may appear to be, there are logistics to consider with the way the screen and sound will display to the audience. For example, a bright sunny day is ideal for a day out in the park, but not for a standard large screen which is intended for use in a darkened room, with far less natural light and direct sunlight to compete with. The alternatives to ensure that your outdoor event is a success in spite of this include specialist outdoor LED screens (although these can be very costly), or simply to look at running the screening in the evening, once the sun has set for far less of a headache! Therefore, it is very common to see evening screenings starting after 8 or 9pm towards the summer. Another matter to consider is logistics of the venue and local area. For example, there may be a requirement to consider the timing and volume of sound as well as visuals. Whether this be noise abatement restrictions within set hours, or the logistics of the venue meaning that the very presence of sound is problematic (hence the requirement for the ‘silent cinema’ at London Zoo, which the organisers are getting around via giving our individual headphones to the audience! ); all in all there is a lot to consider. An obvious consideration for the outdoor event organiser is planning for inclement weather. Whether this is a complete ‘plan b’ such as an alternative indoor or covered space (that perhaps can be negotiated with the venue beforehand), or intermediary solutions, such as hiring in rain coverings, or even individual umbrellas or macs if the weather is liveable! Depending upon the type of event you are running, some other areas to consider include guest comfort (e.g. blankets and / or seating), the seating area size and layout (speak to one of our project managers who can help you work out the ideal size of screen and furthest back position for a good view), and the venue access and arrangements for power for the equipment required. Done well, this type of event, whether an corporate outdoor product launch or consumer outdoor cinema, can be incredibly popular and aesthetically one of the most pleasant of settings. Whatever your event type and venue, we recommend ensuring that you select a knowledgeable audio-visual supplier who has run events of this kind before to really take a weight off your mind! To discuss your outdoor event with our experts, simply get in touch with us. This article was posted in Blog and tagged audio visual, cinema, event managers, event organisers, led screen, london zoo, outdoor cinema, outdoor event, product launch, projection, screening, somerset house. Bookmark the permalink. Follow comments with the RSS feed for this post.Comments are closed, but you can leave a trackback: Trackback URL.